That is the final word count for Ages of Aenya, after completing a first draft back in May of 2011 at 156,584 words. As you can see, I’ve added almost 20,000 words, but cut just as many. A good story requires at least three thorough edits, and this coming after a complete overhaul/rewrite of The Dark Age of Enya; though to be fair, the new book is as similar to the old as Tim Burton’s Batman is to Chris Nolan’s The Dark Knight. Why not a fourth edit? To be honest, the editing has to stop somewhere, otherwise I’d never write anything new. Since I tend to be OCD when it comes to writing, I have promised myself to lay off the book unless a revision is required by an editor from a publishing house. Overall, it’s taken me nine years to rework my older book into what it is today (fourteen if you count from the story’s inception). This is, in part, because I had yet to reach the level of expertise to sit on the shelf with the big name authors. What many aspiring writers probably don’t want to hear (I know I sure didn’t) is that I simply could never have written this book without the many, many, many years of practice. If you’ve written a book and it’s your first, I can almost guarantee it’s crap. Future projects, like The Princess of Aenya, should come easier. This also explains the baffling and often intimidating prolificacy of writers like Stephen King, George R.R. Martin and Stephen Erikson, who seem to shell out 800 page monsters every month. They could not produce so much if they had yet to learn the basics, or if they had to rewrite their entire novels two or three times over. How do I feel now that it’s finally over? Elation. Relief. Dread. Elation because I made it. Many times along the way, I fell into pits of despair. I often wanted to give up, because it felt hopeless, because I feared that nobody cared or that the story would never measure up. These feelings got so bad, at one point I was literally sick in bed for a week! Relief comes from the fact that I can finally take a break. I have been pushing myself to get this done. Oftentimes, I wasn’t in the mood or didn’t feel inspired. One of the most valuable lessons I’ve learned, however, is that you don’t need inspiration to churn out good work, and that often, things you write while inspired only seem good and later need rigorous revision. If you’re an aspiring author and are waiting around for an idea to strike you like lightning, you’ll be waiting around forever. So go write! Finally, there is dread. 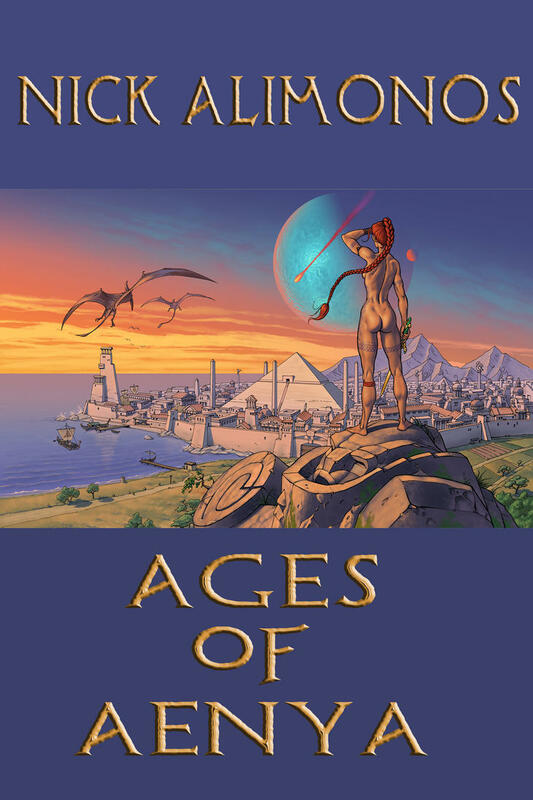 After 14 years of work, Ages of Aenya might just be a lot of incoherent crap. Maybe the story will make little sense to other people, or will lack suspense, or is missing that je ne sais quoi that gets readers to care about the characters. But I have given it my all and I think, when I am honest with myself, it has been worth the effort. Ages of Aenya will become my legacy. It will exist long after I am dead and, I hope, capture the imagination of readers for a generation to come. I know my ambitions seem lofty and maybe sometimes vain, but it’s all part of this mental disorder I call the writers’ disease. It’s not about fame or fortune; it’s just that the book is like my third child, and I can only pray, like any parent, that it finds a place to belong in this world. Perhaps more importantly, Aenya will pave the road for a series of books, as it establishes a new fantasy setting, a marriage between fantasy, Sci-Fi and naturism. To commemorate the event, I commissioned Alexey Lipatov to help design a new cover. He worked on the fine art and I did the layout and lettering in Photoshop. Lipatov beautifully captures the scope of the story, both its fantasy and Sci-Fi aspects. The city has a Roman/Egyptian feel, which is appropriate given the theme of hubris central to the novel. Thelana, by contrast, represents the naturist ethos of innocence and nature. She is literally coming upon civilization and all that entails, a clash of cultures being another theme I explore in the book. Lastly, notice the fossilized golem at her feet? That plays a large role as does the fiery meteor in the background. The golem represents history and the dangers of forgetting our past; the meteor is an omen of things to come.